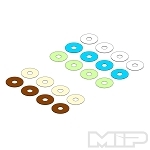 #5106 - MIP American Flag, Die Cut Vinyl Sticker, 3.73" x 1"
Out of Stock, Back Order. 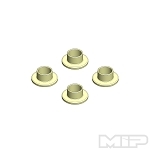 The all new MIP Bypass1™ pistons for the 1/8th Mugen are a MUST HAVE! These pistons are not like anything you have ever experienced before. 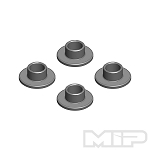 The MIP Bypass1™ pistons are fully customizable and allow you to truly control your cars rebound speed and performance. MIP Bypass1™ Pistons are also Dyno-Tuned to ensure they match the compression characteristics of the stock pistons! 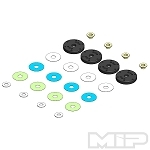 Featuring MIP Color Coded Valves™, the MIP Bypass1™ Pistons combined together with these valves allow you to control and maximize your cars performance based on which valves you use. Thicker valves generate a slower rebound and thinner valves get you quicker rebounds. Mix and match valves together and find the best set up for you and your car! MIP Bypass1™ pistons are being used by some of the top racers in the world including Adam Drake and Ryan Maifield. The MIP Bypass1™ technology is guaranteed to give you that world champion edge on the track! The MIP Bypass1™ technology is here to stay, and will be the STANDARD in RC Racing throughout the universe. Don’t get left behind. The future of of RC Racing is here , order your MIP Bypass1™ Kits today.